Medicine is at a turning point, on the cusp of major change as disruptive technologies such as gene, RNA, and cell therapies enable scientists to approach diseases in new ways. The swiftness of this change is being driven by innovations such as CRISPR gene editing, which makes it possible to correct errors in DNA with relative ease. Progress in this field has been so rapid that the dialogue around potential ethical, societal, and safety issues is scrambling to catch up. This disconnect was brought into stark relief at the Second International Summit on Human Genome Editing, held in Hong Kong in November, when exciting updates about emerging therapies were eclipsed by a disturbing announcement. He Jiankui, a Chinese researcher, claimed that he had edited the genes of two human embryos, and that they had been brought to term. There was immediate outcry from scientists across the world, and He was subjected to intense social pressure, including the removal of his affiliations, for having allegedly disregarded ethical norms and his patients’ safety. Yet as I. Glenn Cohen, faculty director of the Petrie-Flom Center for Health Law Policy, Biotechnology, and Bioethics at Harvard Law School, has said, gene editing comes in many varieties, with many consequences. Any deep ethical discussion needs to take into account those distinctions. The germline editing He claimed to have carried out is quite different from the somatic gene therapies that are currently changing the frontiers of medicine. While somatic gene editing affects only the patient being treated (and only some of his or her cells), germline editing affects all cells in an organism, including eggs and sperm, and so is passed on to future generations. The possible consequences of that are difficult to predict. 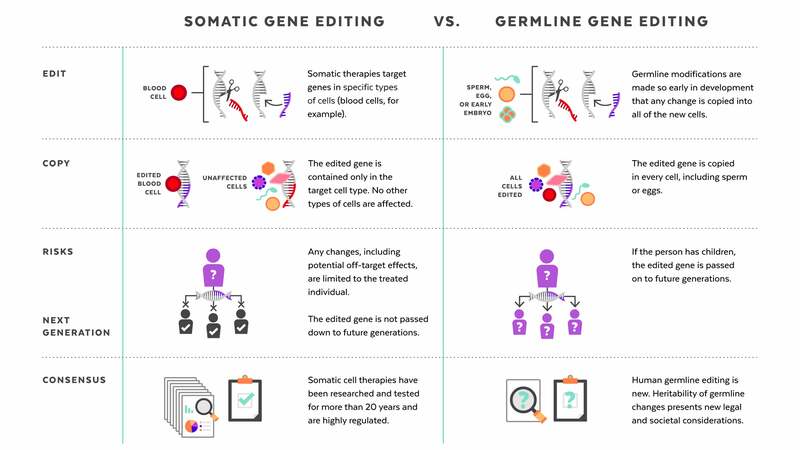 Somatic gene therapies involve modifying a patient’s DNA to treat or cure a disease caused by a genetic mutation. In one clinical trial, for example, scientists take blood stem cells from a patient, use CRISPR techniques to correct the genetic mutation causing them to produce defective blood cells, then infuse the “corrected” cells back into the patient, where they produce healthy hemoglobin. The treatment changes the patient’s blood cells, but not his or her sperm or eggs. Germline human genome editing, on the other hand, alters the genome of a human embryo at its earliest stages. This may affect every cell, which means it has an impact not only on the person who may result, but possibly on his or her descendants. There are, therefore, substantial restrictions on its use. Germline editing in a dish can help researchers figure out what the health benefits could be, and how to reduce risks. 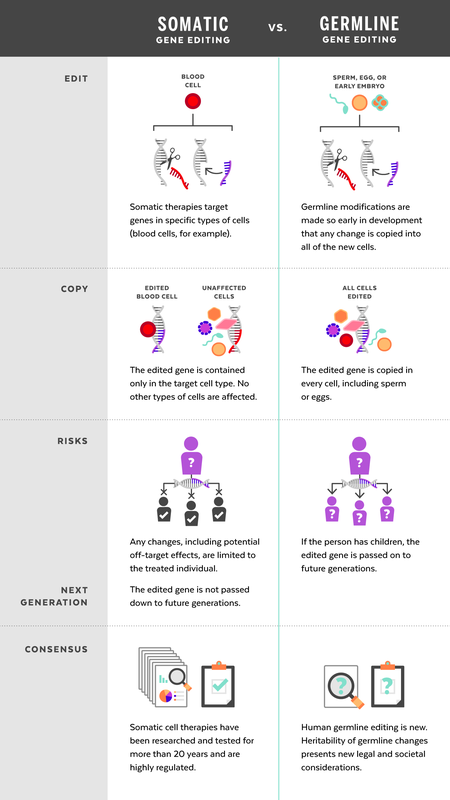 Those include targeting the wrong gene; off-target impacts, in which editing a gene might fix one problem but cause another; and mosaicism, in which only some copies of the gene are altered. For these and other reasons, the scientific community approaches germline editing with caution, and the U.S. and many other countries have substantial policy and regulatory restrictions on using germline human genome editing in people. But many scientific leaders are asking: When the benefits are believed to outweigh the risks, and dangers can be avoided, should science consider moving forward with germline genome editing to improve human health? If the answer is yes, how can researchers do so responsibly? Professors at the University’s schools of medicine, law, business, and government saw He’s announcement as a turning point in the discussion about heritable gene therapies and shared their perspectives on the future of this technology with the Gazette. Aside from the safety risks, human genome editing poses some hefty ethical questions. For families who have watched their children suffer from devastating genetic diseases, the technology offers the hope of editing cruel mutations out of the gene pool. For those living in poverty, it is yet another way for the privileged to vault ahead. One open question is where to draw the line between disease treatment and enhancement, and how to enforce it, considering differing attitudes toward conditions such as deafness. “This question is not as new as it seems. Evolution progresses by random mutations in the genome, which dwarf what can be done artificially with CRISPR. These random mutations often cause serious problems, and people are born with serious defects. In addition, we have been manipulating our environment in so many ways and exposing ourselves to a lot of chemicals that cause unknown changes to our genome. If we are concerned about making precise interventions to cure disease, we should also be interested in that. “Before we start working on embryos, we have a long way to go, and civilization has to think long and hard about it. There’s no question that gene editing technologies are potentially transformative and are the ultimate precision medicine. If you could precisely correct or delete genes that are causing problems — mutating or aberrant genes — that is the ultimate in precision. It would be so transformative for people with diseases caused by a single gene mutation, like sickle cell anemia and cystic fibrosis. Developing safe, effective ways to use gene editing to treat people with serious diseases with no known cures has so much potential to relieve suffering that it is hard to see how anyone could be against it. “There is also commercial potential and that will drive it forward. A lot of companies are getting venture funding for interesting gene therapies, but they’re all going after tough medical conditions where there is an unmet need — [where] nothing is working — and they’re trying to find gene therapies to cure those diseases. Why should we stop trying to find cures? “It’s time to formulate what a clinical path to translation might look like so that we can talk about it. That does not mean that we’re ready to go into the clinic — we are not. We need to specify what the hurdles would be if one were to move forward responsibly and ethically. If you can’t surmount those hurdles, you don’t move forward. “For the past 15 years, I have been involved in efforts to establish international standards of professional conduct for stem cell research and its clinical translation, knowing full well that there could be — and has been — a growing number of independent practitioners directly marketing unproven interventions to vulnerable patients through the internet. We advocated so strongly for professional standards in an attempt to ward off the risks of an unregulated industry. Though imperfect, our efforts to encourage a common set of professional practices have been influential. “You can’t control rogue scientists in any field. But with strongly defined guidelines for responsible professional conduct in place, such ethical violations like those of Dr. He should remain a backwater, because most practitioners will adhere to generally accepted norms. Scientists have a responsibility to come together to articulate professional standards and live by them. One has to raise the bar very high to define what the standards of safety and efficacy are, and what kind of oversight and independent judgment would be required for any approval. “I think we should slow down in our reaction to this case. It is not clear that the U.S. needs to react to Dr. He’s announcement with regulation. The FDA [Food and Drug Administration] already has a strong policy on germline gene editing in place. A rider in the Consolidated Appropriations Act of 2016 — since renewed — would have blocked the very same clinical application of human germline editing He announced, had it been attempted in the U.S.
“The scientific community has responded in the way I’d have liked it to. There is a difference between ‘governance’ and ‘self-governance.’ Where government uses law, the scientific community uses peer review, public censure, promotions, university affiliations, and funding to regulate themselves. In China, in Dr. He’s case, you have someone who’s (allegedly) broken national law and scientific conventions. That doesn’t mean you should halt research being done by everyone who’s law-abiding. Professor Kevin Eggan of Harvard’s Department of Stem Cell and Regenerative Biology said, “The question we should focus on is: Will this be safe and help the health of a child? Can we demonstrate that we can fix a mutation that will cause a terrible health problem, accurately and without the risk of harming their potential child? If the answer is yes, then I believe germline human genome editing is likely to gain acceptance in time. “There could be situations where it could help a couple, but the risks of something going wrong are real. But at this point, it would be impossible to make a risk-benefit calculation in a responsible manner for that couple. Before we could ever move toward the clinic, the scientific community must come to a consensus on how to measure success, and how to measure off-target effects in animal models. “Even as recently as this past spring and fall, the results of animal studies using CRISPR — the same techniques Dr. He claimed to have used — generated a lot of confusion. There is disagreement about both the quality of the data and how to interpret it. Until we can come to agreement about what the results of animal experiments mean, how could we possibly move forward with people? “Until the work is done, carefully and with tight oversight, to understand any off-target effects of replacing or removing a particular gene, it is inappropriate to apply the technology in the clinical field. My understanding of Dr. He’s case is that there wasn’t a known condition in these embryos, and by editing the genes involved with HIV infection, he could also have increased the risks of susceptibility to influenza and West Nile viruses. “These were not diseased babies Dr. He was trying to cure. The motivation for the intervention was that they live in a country with a high stigma attached to HIV/AIDS, and the father had it and agreed to the intervention because he wanted to keep his children from contracting AIDS. AIDS shaming is a fact of life in China, and now it won’t be applied to these children. So, are we going to decide that it’s OK to edit as-yet-to-be children to cater to this particular idea of a society? “It’s been said that ‘the genie is out of the bottle’ with germline human genome editing. I just don’t think that’s true. After all, we have succeeded in keeping ‘nuclear’ inside the bottle. Humanity doesn’t lack the will, intelligence, or creativity to come up with ways for using technology for good and not ill.
“We don’t require students to learn the moral dimensions of science and technology, and that has to change. I think we face similar challenges in robotics, artificial intelligence, and all kinds of frontier fields that have the potential to change not just individuals but the entirety of what it means to be a human being. “Science has this huge advantage over most professional thought in that it has a universal language. Scientists can hop from lab to lab internationally in a way that lawyers cannot because laws are written in many languages and don’t translate easily. It takes a very long time for people to understand each other across these boundaries. A foundational concept for human dignity? It would not be the same thing between cultures. Olga Romanova, Mattea Mrkusic, and Michael Liu talk about their future studies.